It will be difficult to make in India much unless the coal problem is solved. On September 9, when Uttar Pradesh Chief Minister Akhilesh Yadav was busy campaigning for his nephew Tej Pratap at the family's pocket borough Mainpuri for the recent bypolls, his key officials were camping in two places for a task that could swing voters' mood in his favour. Their challenge was to secure coal supply for power plants in the state. Eight of 12 power plants had run out of fuel, with four facing a shutdown, and the government had to ensure there were no outages, at least until the votes had been cast. Sluggish pace: A Coal India mine in Odisha. The state-run miner has consistently failed to meet demand. Photo: Vivan Mehra. So, officials from the state's power generation company, UP Rajya Vidyut Utpadan Nigam, went to Dhanbad in neighbouring Jharkhand, to meet Coal India executives in a desperate bid to resume coal supplies. Naxals had a few days earlier blown up the rail link in Latehar district of Jharkhand and coal was being diverted to Gomuh in Bihar before heading for UP, causing delays and shortages. Meanwhile, N.C. Bajpai, Vice Chairman of the state planning commission, and Sanjay Agarwal, Energy Secretary and Chairman of Uttar Pradesh Power Corporation, were in Delhi to lobby for additional supplies. The day ended with Yadav trading charges with Piyush Goyal, who holds independent charge of both power and coal ministries in the central government. In Uttar Pradesh, power cuts of eight to 12 hours are common during summer, but the situation has worsened in the past few months. The industrial towns of Ghaziabad, Allahabad and Kanpur are also routinely facing power cuts of 12 hours. No wonder, then, that electricity supply - or the lack of it - had become an important election issue. Akhilesh Yadav has not made any noises about the coal shortage after the bypolls, but for Goyal the coal supply situation and its effect on the power sector is perhaps the biggest and most urgent problem that needs solving. Even in the best of times, India manages to produce only 160 gigawatt of electricity out of its total installed capacity of 250 GW. This is largely because of fuel shortages, and coal is the fuel for most of these plants. The country lost more than 15 billion units of electricity due to non-availability of coal in the last two fiscal years, leading to a peak deficit of 15 per cent. A study by industry group FICCI estimates that power problems in 2011/12 caused a loss of $64 billion to the economy, or roughly 0.4 per cent of gross domestic product. Much of Prime Minister Narendra Modi's plans for industrial revival depends on his ambitious Make in India programme. But those plans will trip unless Goyal can sort out the coal mess and ensure 24/7 power to industrial units across the country. To get all the thermal power plants running at full steam, and also fuel the new plants that will be needed as more industries are set up and the power demand rises, Goyal will need to ensure that the country produces a minimum of one billion tonnes a year. This seems like an ambitious target at this moment, but more on that later. The worry is that the fuel crisis is worsening and there are no short-term solutions in sight. In 2008, power plants had coal stocks of 10 days on average at the beginning of each month. By 2014, the average has come down to six days. According to the guidelines of the Central Electricity Authority, the power ministry's technical wing, thermal power plants have to maintain coal stocks for 15 to 30 days. The agency's data published on coal supplies for September 10 showed that only 12 of 100 plants had stocks for 15 days and 64 plants that make up more than 40 per cent of the country's installed thermal capacity had stocks for a week or less. 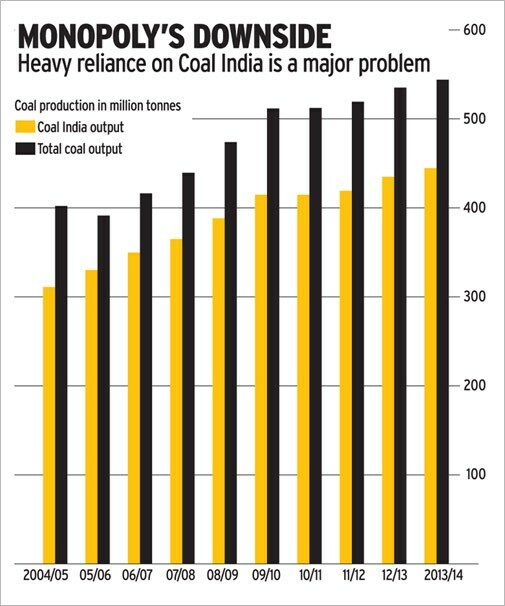 Since most coal is carried on railway wagons, even the slightest delay in coal supplies can shut down these plants and impact industrial output. The irony is that India is sitting on an estimated 301 billion tonnes of coal reserves, according to government data. This is enough for another 200 years of India's needs. Yet, the country has been struggling to increase coal supplies to meet the growing requirements of its power and other industries. And while "Coalgate" - the term coined for irregularities in coal mine allocations to private players by past governments - is grabbing all the attention, this is the least of Goyal's problems. Even if the Supreme Court were to cancel all allocations since 1993, it would only affect 40 million tonnes of the 587 million tonnes that was produced last year in the country. This is because only 40 of the 216 coal mines allocated to private players are actually being mined. The rest are still waiting for environmental or other clearances. 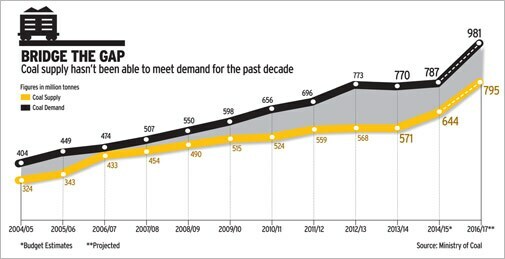 The bigger problem is that Coal India, the public-sector monopoly that produces 80 per cent of the coal in the country, has been unable to boost production dramatically to meet rising demand. Its annual production has inched up from 431.26 million tonnes in 2009/10 to an estimated 462.46 million tonnes in 2013/14. This has forced power companies to look for alternatives. Some bought coal mines abroad while others relied on gas supply from the Krishna-Godavari Basin, off the country's east coast. Neither option has succeeded. Imports have proved costly while gas supply from the KG basin has fallen drastically, leaving many gas-fired plants idle. Because of the erratic power situation, companies across the country are depending on backup systems that increase costs. There is a surge in demand for solar power and diesel generation sets, says Kunwer Sachdev, Managing Director at inverter maker Su-Kam Power Systems. Coimbatore-based foundry owner Prabhu Gandhikumar says he shells out Rs 1.5 lakh more on diesel generation sets to run furnaces, in addition to the Rs 2.5-lakh electricity bill he pays. "If I get regular power supply, I will have to pay an additional few thousand rupees, but I can save whatever money I am spending now on diesel sets," he says. In May, Prime Minister Modi formed a BJP-led government at the Centre after a thumping victory in Lok Sabha elections. One of his poll promises was to provide electricity access across the country. In a country where an estimated 30 crore people do not have access to electricity, it is a huge promise. As chief minister of Gujarat, Modi had ensured round-the-clock access to power, and turned around loss-making utilities. To implement his aim at the national level, Modi appointed banker-turned-politician Goyal as minister responsible for both coal and power. Modi set Goyal the goal of increasing coal production to one billion tonnes a year by 2019. To achieve this target, coal production will have to grow by more than 18 per cent annually. This pace hasn't been achieved in the last decade. India also missed its target to ramp up coal output to 680 million tonnes by the end of the 11th five-year plan (2007-12), as production touched only 540 million tonnes in 2011/12. For perspective, China produces roughly 3.5 billion tonnes a year. When Goyal took charge of the power ministry, he pushed for higher generation and that added to the fuel supply problem. "In the first three months of the new government - June, July and August - coal-based electricity generation rose 21 per cent," he said. "But the [coal] supply has gone up by only five or six per cent. The stocks are bound to fall," he said on September 7, blaming poor rainfall for the rise in demand for power and coal. In the last week of July, nominated Rajya Sabha MP Anu Aga gifted Goyal a book Power Struggle, authored by her late husband Rohinton Aga two decades ago. Goyal says he got several solutions to the coal supply problems from the book. One was optimum utilisation of coal and the second, rationalisation of supplies. 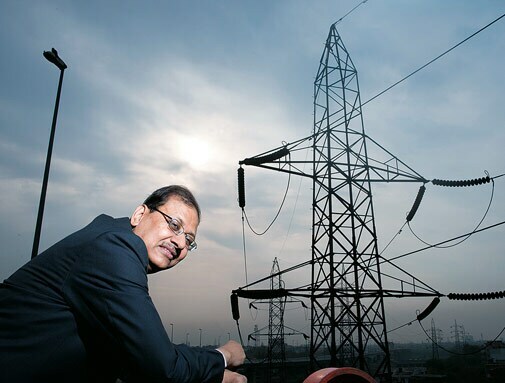 On September 3, he allowed state-run NTPC and Gujarat government utilities to swap coal. 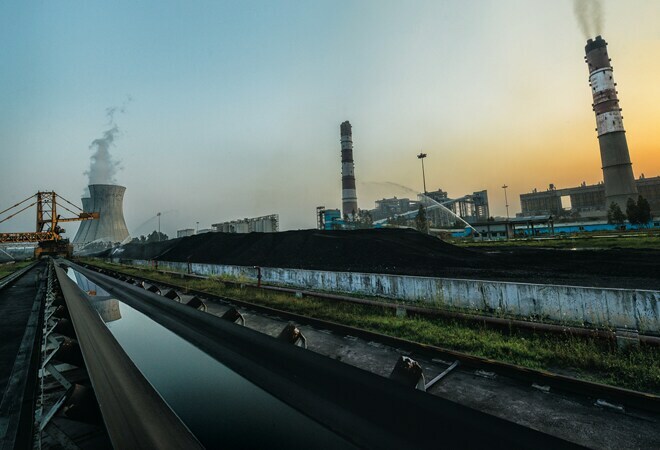 NTPC, the country's biggest power generator, had been importing coal at ports in Gujarat for its Korba power plant in Chhattisgarh, whereas the Gujarat utilities were procuring it from Coal India's Korba mines. The power ministry believes the swapping arrangement would unclog coal supplies and help save Rs 400 crore to Rs 500 crore. A coal ministry official says consultancy KPMG has been asked to analyse 200 mines and their supply linkages. "We are expecting more unclogging once the KPMG report comes," the official says. These steps are in the right direction but would require at least six to seven months to show results on the ground, says Deepak Amitabh, Chairman and Managing Director of power trading firm PTC India. Goyal is pushing ageing power plants to upgrade, especially those which are more than 25 years old. "This will help utilities produce more power from the same amount of coal," says Ashok Khurana, Director General of the Association of Power Producers. Goyal is also working with the railway ministry to expedite work on rail lines to transport coal from mines to power plants. These include the 100-km long Tori-Shivpur-Hazaribagh track in Jharkhand, the Mand-Raigad track in Chhattisgarh, and a 100 to 120-km line between Bhupdevapur and Manoharpur in Orissa. These lines would facilitate evacuation of 60 million tonnes of coal by 2017/18 and up to 200 million tonnes by 2021/22 . Besides, the Centre is looking to put in place a coal regulator. The previous United Progressive Alliance (UPA) government had tabled a coal regulator bill in Parliament but it lapsed with the dissolution of the 15th Lok Sabha. The coal ministry has now been asked to work out a "more powerful" coal regulator bill, which might be tabled in the next session. The regulator will likely be empowered to oversee auctioning of coal mines and will also keep an eye on the fuel's prices. 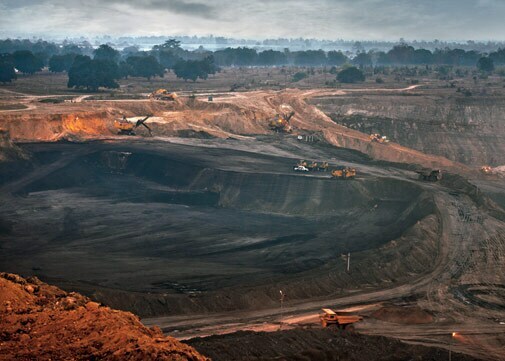 In 2012, the Comptroller and Auditor General of India questioned the allocation of coal mines between 2004 and 2009 to companies without competitive bidding. At the time, the BJP was in opposition and had slammed the Congress-led UPA government for not auctioning the blocks. The Coalgate scandal has had several twists and turns since then. In August, the Supreme Court declared the 216 blocks allocated since 1993 as illegal. On September 9, the court reserved its order on the fate of the blocks and rejected a plea by steel and power producers to appoint a judicial commission to resolve the issue. A senior functionary of the Rashtriya Swayamsevak Sangh, the BJP's ideological parent, feels that the court ruling is a good opportunity to restart with a clean slate. "The government should come up with a policy which is well thought-out and does not come with a baggage," he says. Coal ministry officials say they can, within six months, come out with a new policy for allocation of mining blocks once the Supreme Court pronounces its final order. Goyal says the government will comply with the court's verdict on the fate of the allocated blocks and will quickly act to ensure adequate coal supplies to all power plants. "I am confident that if at all there is a disruption, we will keep it to the bare minimum. There might be a short-term disruption but in the medium to long term, we will be able to open up many more [coal mines]," he says. Some companies feel the court should not penalise them by cancelling the blocks because they were only following the government policy of the day. Other power producers, however, argue that auctions - like in the case of telecom spectrum - may not be a bad idea if it makes coal supply more reliable, although it could push up coal prices and power tariffs. There are other risks as well if the apex court cancels the blocks. Kameswara Rao, Leader of Energy Practice at PricewaterhouseCoopers' India chapter, says cancellation of the blocks would jeopardise a huge amount of bank loans these companies had taken on. Naveen Jindal, whose company Jindal Steel and Power and its subsidiaries face cancellation of 10 mines, says that investment worth Rs 4 lakh crore to develop the mines - otherwise discarded by Coal India - run the risk of going waste. "Of this, Rs 2.5 lakh crore is bank loans," he said. Other companies involved in the scandal include JSW Steel, Hindalco Industries, and NTPC. 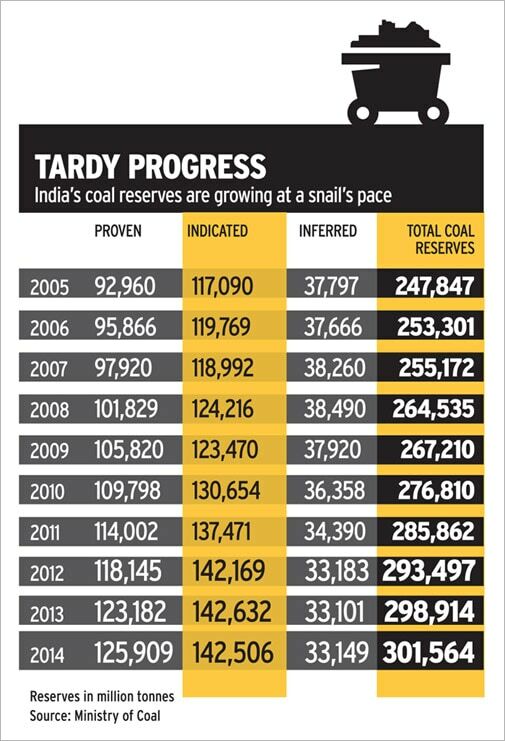 The biggest hindrance to increasing coal production has been the delay in environmental and forest clearances. During the UPA regime, then-environment minister Jairam Ramesh's propagation of go and no-go areas for mining and later slow decision making by his successor Jayanthi Natarajan led to delays in approvals. When BJP spokesperson Prakash Javadekar took charge of the ministry, the message to him from Modi was clear - facilitate, mediate, but don't obstruct. The ministry has now asked the Forest Survey of India (FSI) to review Ramesh's policy that had led to 30 per cent of coal-bearing areas coming under the no-go zones on environmental grounds. The no-go zone impacted 153 coal-bearing blocks in six states. Environment ministry officials told BT the FSI is changing the parameters fixed to determine these areas and may exclude some areas from the no-go zone. 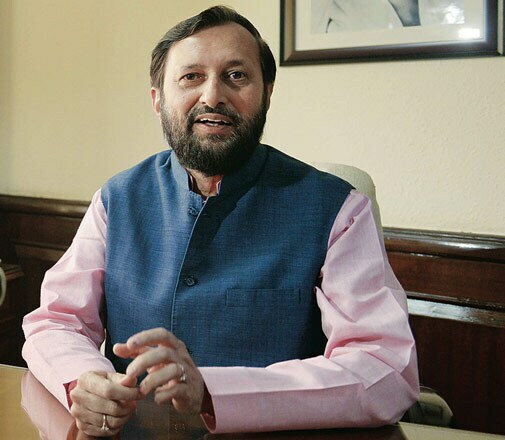 Javadekar told newsmen recently decision making in the environment ministry will now be quicker. "We have made it clear that there will be a simpler, cleaner, speedier and transparent online mechanism in the [environment] ministry," he said. To make mining less polluting for the environment, Harry Dhaul, Secretary General of the Independent Power Producers' Association, suggests a renewed focus on underground mining. A Coal India official says India has 80 billion tonnes of reserves at a depth of 300 metres or more and that the government has asked Coal India to look into the possibility of increasing the contribution of underground mining in coal output to 30 per cent from three to four per cent currently. Executives from the coal and power industries believe that most steps the Modi government is taking to improve supplies are in the right direction. But not everyone is convinced the measures are enough. Prabir Neogi, CEO for new initiatives on fuel and power at Kolkata-based utility CESC, says it is yet to be seen what role the government envisages for private players in mining, whether they are allowed to do commercial mining or confined to the role of contractors. Neogi, who also heads FICCI's coal committee, says the long-term plan has to revolve around Coal India. Many believe the best solution to improve Coal India's productivity is to break it up into smaller units and make state governments stakeholders. Goyal, however, is not in favour of breaking up the mining behemoth. It is clear, however, that the situation won't improve overnight. "There are no quick-fix solutions," says Neogi. "The government is plugging the gaps, but we will have to wait till at least March to see any improvement."